Hundreds of people, and one inspring sheep, joined Animals Australia for an urgent rally to help close the loophole that is permitting some Australian abattoirs to slaughter fully conscious sheep without stunning. Despite clear scientific evidence an overwhelming community sentiment, the primary industries ministers have failed to arrive at a decision on non-stun slaughter. Click here to learn more. We'd like to extend a heartfelt thank you to the hundreds of caring people of Melbourne who joined Animals Australia on Thursday evening to call for an end to conscious slaughter in Australia. 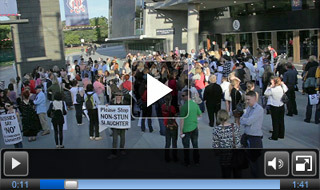 As the primary industries ministers arrived at the MCG for their dinner meeting, they couldn't miss the clear message from the crowd of concerned Victorians (and one very handsome sheep) — a reminder that all Australians who care about animals are depending on them to close the loophole on un-stunned slaughter. Click here to watch the video coverage on ABC. In the past two days, over 17,000 Animals Australia supporters have written to these ministers. Those who came to the MCG proudly represented all those who care about this issue. We expect the ministers discussed their decision on Thursday evening. On Friday morning during the vote, there will be no doubt in their minds what the Australian community expects of them. We await the outcome of this decision and will post updates to this page and via Facebook as soon as the outcome has been made public. Thank you again to everyone who joined our campaigners and Timmy the Sheep (from Edgar's Mission) at the MCG at such short notice to send one final and very important plea for mercy. While there were some ministers who evaded our gathering, we have sent the photograph below to all ministers to ensure they can see how important this issue is to caring people like you. Click here to see more photos from this event on our Facebook page.